ANDO VARIETY. RARITY-6. SOLE HIGHEST GRADED AT PCGS. CAC. 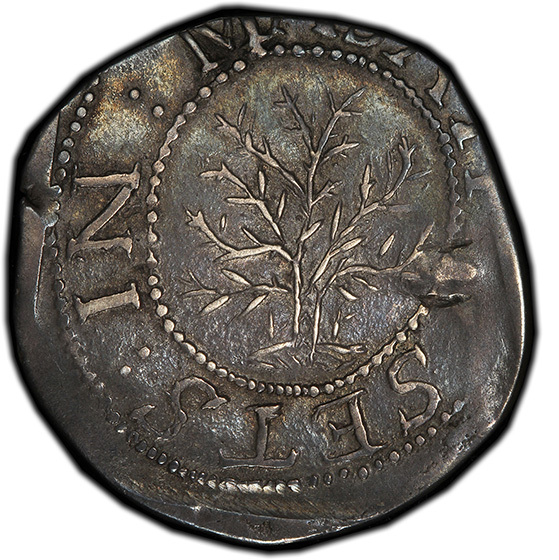 When the new world was settled in the earliest years of the seventeenth century, the necessity for coins did not arise until mid-century. This is likely due to the smaller populations and unstable economic conditions of the earliest settlements. Furthermore, settlers found natives had no need for monetary commodities and preferred bartered goods or consumables. By 1652 the once small colonies had grown into larger towns and cities that resembled the English towns they left behind. At this point it was easier to keep track of and apply value to a small commodity than to bundles of tobacco. Colonies were often shorted on English money thanks to frequent wars, yet they were unauthorized to produce their own coinage- a law put in place by the King who wished to keep control of his distant lands. Eventually it became difficult to keep up with overseas coinage demand. 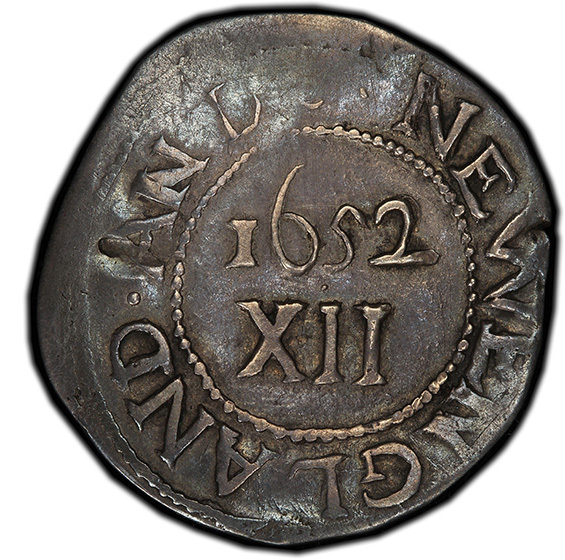 As a result, the Massachusetts Bay Colony gained mint authorization in 1652. The very first United States mint was nothing more than a blacksmith shop in a basement. The Boston mint was run by two men, John Hull and Robert Saunderson, who primarily struck silver shillings with the occasional smaller denomination coin. To maintain the right to strike coinage, the thirteen colonies could not move away from the English system and would not be able to do so for another one-hundred and fifty years; this worked fine for the time being. The premiere shillings were very plain with “NE” (for New England) on the obverse and a simple XII (to show a denomination of twelve pence) on the reverse. Minters realized these coins were two easily clipped for metal or counterfeited, so new designs were added to the coin to prevent this. The second design - after the willow tree - was this oak tree. The addition of the trees proved to deter clippers and counterfeits. Oak Tree shillings come in five die varieties: IN at left, IN at bottom, ANDO, "Ghost" Tree, and "Spiny" tree. 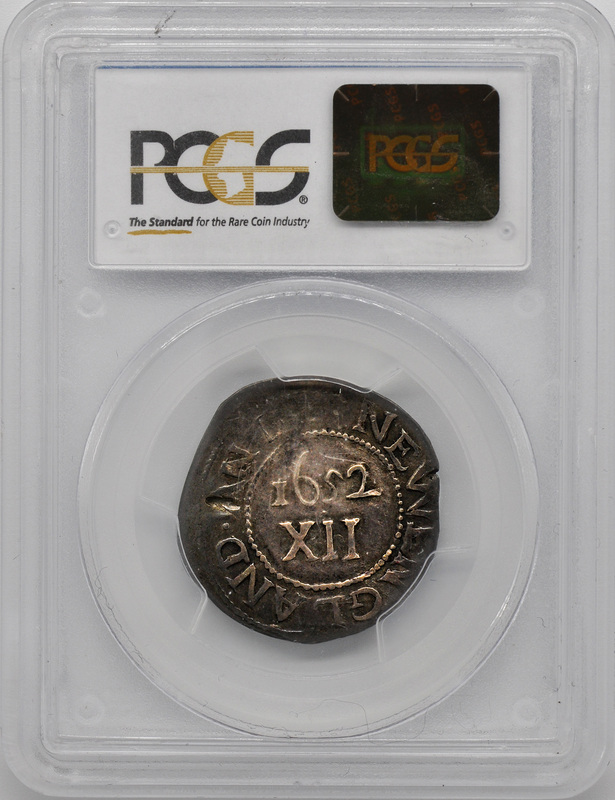 On the reverse of this coin are the words ANDOM (Short for Anno Domini, long for AD) and NEW ENGLAND which encircled the original date the colony was authorized to mint- not the strike date- and the denomination for twelve pence or XII. 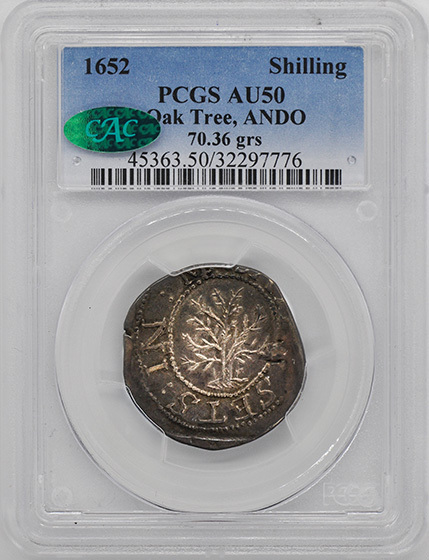 All the tree variety coins were named centuries after they were struck and are guesses as to the type of tree. The plethora of varieties these coins offer create a spectacular opportunity for collectors to experience and hold the beginnings of American Coinage History.